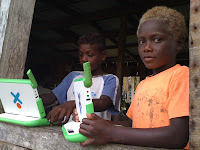 OLPC Oceania: Solomons' Marovo pioneers a new "Pacific way"
Solomons' Marovo pioneers a new "Pacific way"
A decade ago, the Solomon Islands was still a nation wracked by civil war. Today, inspiring stories of empowerment and rejuvenation are to be found, such as that among the communities of the country's remote Marovo Lagoon in Western Province. December 2010 marks 10 years since the people of this beautiful and fragile environment accessed email for the first time, via the ground-breaking People First Network (PFNet). Today, Marovo is buzzing with innovative ICT-for-education projects which are motivating students, connecting people, empowering communities and pointing to the possibilities of a new "Pacific way" on education. Grass roots communities are driving these projects with support and assistance from their national government and its partners in development in the bilateral, regional, non-profit and private sectors. 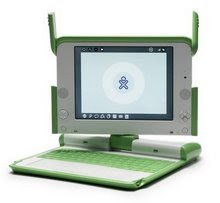 Primary schools in the villages of Patukae, Batuna and Sombiro have been using XO laptops donated by the OLPC Foundation since 2008. Distance Learning Centres, funded by the EU, have connected rural community high schools like Patukae since 2006. The community can access VSAT broadband in the area via the Pacific Rural Internet Connectivity System (PACRICS), seed-funded by AusAID, ongoing funding from the Asian Development Bank and implemented by the Secretariat of the Pacific Community, supported by the UEPI Resort and Marovo Sustainable Timbers. Patukae High School was in September 2010 the recipient of donated computers and personal training from the Scots College, Sydney, one of Australia's oldest schools. The Marovo Reef and Rainforest Wiki Project see previous post or find out more here.